That’s what one reviewer said about the cover on the first book (Yuletide Baby) of my new series, Cowboy Country. And boy, is she right. Harlequin’s art department planned out a specific identifying feel for the series and I have to say I love it. Close-ups of cute cowboys and adorable babies. What more could a writer ask for? The process for cover art at Harlequin is a bit different than other publishers. Authors fill out an Art Fact Sheet including character pages, a short synopsis of the book and three scene suggestions. I always provide pictures of how I think the characters look, as well as of various background details. But other than that I have very little input into the process. Covers are never exactly as I pictured it in my mind, but for the most part I’ve been happy with the results. In the original cover for The Christmas Groom the guy on the cover has dark-brown hair, whereas my hero in the book has white-blond hair. However, it’s such a breathtaking cover that I wasn’t about to complain. I’ll admit to being slightly disappointed with the buzz-cut shaved redheaded boys on The Nanny’s Twin Blessings when the twins in my book were tow-headed with Carey Grant comb-overs. And yes, I had sent pictures. Then of course was the real doozy—the time my cover art for The Forgiving Heart was accidentally switched with Irene Brand’s The Test of Love and it was too late to do anything about it since the books had already been printed. Recently authors have been given the opportunity to review the cover before it goes into final print, which is a nice plus, and like I said, I have zero complaints about my Cowboy Country covers. So what about you? What draws you to a cover? People? Scenery? Are you disappointed when the characters don’t look like the descriptions in the book? I’m also hosting a giveaway. Simply visit my books page on my website (http://www.debkastnerbooks.com/books.html) as well (and don’t forget to consider my Cowboy Country covers that are on this blog!) and post below which one of my covers is your favorite. If you win I’ll give you an autographed copy of that book. 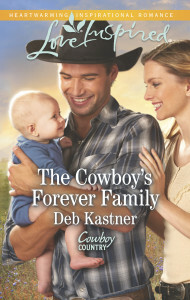 Deb Kastner’s next release with Harlequin Love Inspired, The Cowboy’s Forever Family, will be available in stores in late February and on Kindle March first. ~~Love Courageously~~ Publisher's Weekly Bestselling, award-winning author of 30 novels, Deb Kastner enjoys writing contemporary inspirational western stories set in small communities. She feels especially blessed to be able to include faith as a natural and genuine part of her characters' lives. Deb lives in beautiful Colorado with her husband and a pack of miscreant mutts. She is blessed with three adult daughters and two grandchildren. Her favorite hobby is spoiling her grandchildren, but she also enjoys reading, watching movies, listening to music (The Texas Tenors are her fav), singing in the church choir, and exploring the Rocky Mountains on horseback. There are some nice covers there! (Although I did giggle a little at the 90’s covers ;) It was so the fashion those days!) I think my favorite cover is “The Cowboy’s Forever Family” There is just something about the way they are interacting that spells “LOVE”. You have some really great covers. My favorite, though, is your new one, “The Cowboy’s Forever Family”. Oh my goodness, Deb! I would probably have a heart attack if my cover had been switched with another author’s cover. I’m admittedly too much of a control freak. I’m thankful everything turned out fine, though, as it always seems to do. You have some great covers (I love those cowboys and can never resist a man with a child in his arms), and your stories are always very special. Congrats on the new releases! Blessings to you in 2015! I love the book cover for The Heart of A Man. I like when the cover people are close to what the author describes in the book. I like covers the are bright and show scenery as well as the characters. I like many books so any one would be great.